Google has unveiled a new digital gaming platform called Stadia which will stream better-than-console-quality games that have traditionally had to be either downloaded or purchased on disk. At launch it will work on existing desktops, laptops, TVs and phones, said the firm’s Phil Harrison. 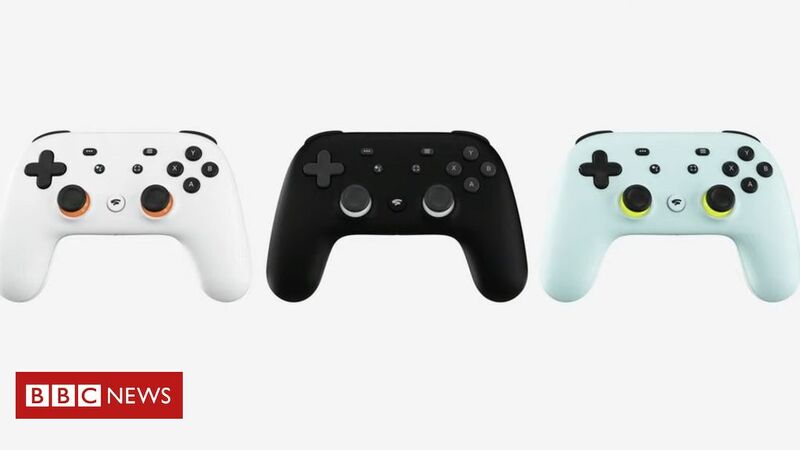 Google also revealed a controller. It looks like a traditional console gamepad but the Stadia version has a button for capturing and sharing gaming directly to YouTube. It was also announced that id Software’s major title Doom Eternal will be one of the first games available. No pricing was revealed at the event in San Francisco but the firm did say Stadia would launch in 2019 in the US, UK, Canada and Europe. Google experimented with streaming data-rich games in 2018 with Project Stream, when the tech giant made the Ubisoft game Assassin’s Creed: Odyssey available to play to trial participants via the Chrome web browser. This is possible because the games run elsewhere, on Google’s own high-end hardware, but users connect to the game with their device via the web. “We learned that we could bring a triple-A game to any device with a Chrome browser and an internet connection,” said Google chief executive Sundar Pichai, referring to big-budget titles. However, many streaming services to date have suffered due to the difficulty of offering high-end games via an internet connection. Gamers have complained of issues with “lag” – the delay between a player performing an action, and the game reacting to that move. In games where split-second reactions are a matter of winning or losing, high latency rates infuriates players. In an attempt to avoid this, Google said its Stadia controller will connect directly to Google’s servers via wifi. The company has promised the service will offer games at 4K resolution, at 60 frames per second (fps) – and up to 8K, 120 fps in future. Today’s most advanced consoles, the XBox One X and Playstation 4 Pro, can support 4K and 60 fps simultaneously, but only on a limited number of games. How significant is Google’s announcement? Google is hoping to leverage its success with YouTube, which is incredibly popular among gamers sharing their skills, to make its own gaming platform a success. “Hundreds of millions of people watch gaming content on YouTube every single day. Our vision is to bring those worlds closer together,” said Phil Harrison, Google’s newly-hired head of gaming. During an on-stage demonstration, Mr Harrison demonstrated how someone viewing a video on YouTube could press a “play on Stadia” button and begin playing the title within seconds. Randolph Ramsay, editor in chief of gaming news site GameSpot, said the announcement was exciting news for gamers. “It’s been a long time since a brand-new platform came along that could challenge the major players like Microsoft and Sony,” he told the BBC. Mr Ramsay added that Google would now have to prove that lag and latency could be a thing of the past on Stadia. Some developers also expressed caution. “Stadia looks very ambitious, but how much is the controller, how much is the service, what games do we get, how will ownership work, and how much does it cost to develop, publish and run games on Stadia?” tweeted Dr Serkan Koto, from Tokyo-based games industry consultancy firm Kantan Games. Matthew Bailey, senior analyst at Ovum, told the BBC that if cloud gaming becomes fully mainstream, traditional gaming consoles would be under threat. However he noted that so far the market remains buoyant. Microsoft’s Games Stack and EA’s Project Atlas share similar aims to Google’s Stadia, commented Piers Harding-Rolls, lead games analyst at IHS Markit. “Cloud is the new platform dynamic for the games sector and will be where the future competitive landscape resides,” he said.